Houston, Texas-based startup Procyrion, Inc. has been selected as one of the semi finalists for the 7th Universal Biotech Innovation Prize 2015, for the development of the Aortix heart pump system for patients with chronic heart failure. There are currently 17 finalist life science projects that were selected from a total of over 280 applications, and the winners will be announced on October 5, in Paris, France. The Innovation Prize organization, which was launched in 2009 by a division of Universal Medica Group called Universal Biotech, selected Aortix due to its revolutionary technology. It is the first catheter-based circulatory heart pump meant to be used in ambulatory and developed specifically to treat patients with NYHA Class III-IVa heart failure, who are too sick for medication alone, but not sick enough for surgical interventions such as LVAD or transplant. The pump is thinner than a pencil and it resembles a torpedo. 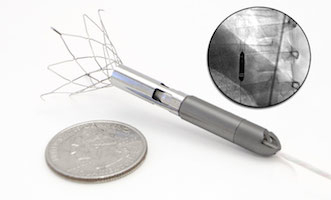 Despite being small, Aortix is a powerful micro pump mounted within a self-expanding anchoring system, which is delivered via a catheter in the femoral artery to the descending thoracic aorta and secured in place with novel self-expanding anchors that deploy to fix the pump to the aortic wall. The small size and unique design of the catheter-deployed, intra-aortic circulatory assist pump enables its placement in a quick and simple ten-minute outpatient procedure. Procyrion is now competing with 16 other projects from all over the world that will be reviewed by a jury panel of international specialists in life sciences according to scientific quality of the innovation, level of intellectual property, quality of the human resources, project feasibility and chance of success on the market or investor interest. The jury will choose two winners who will be awarded a shared prize of €60,000 ($66,500) plus consulting services. The company had also been recently invited to visit France and present pre-clinical data on Aortix at the 2015 International Society for Heart and Lung Transplantation (ISHLT) 35th Annual Meeting & Scientific Session, which took place April 15 in Nice. The founder and chief medical officer of Procyrion, Reynolds M. Delgado III represented the company to discuss the possibility of using a long-term power lead for exiting the femoral artery, in order to empower an intravascular blood pump.